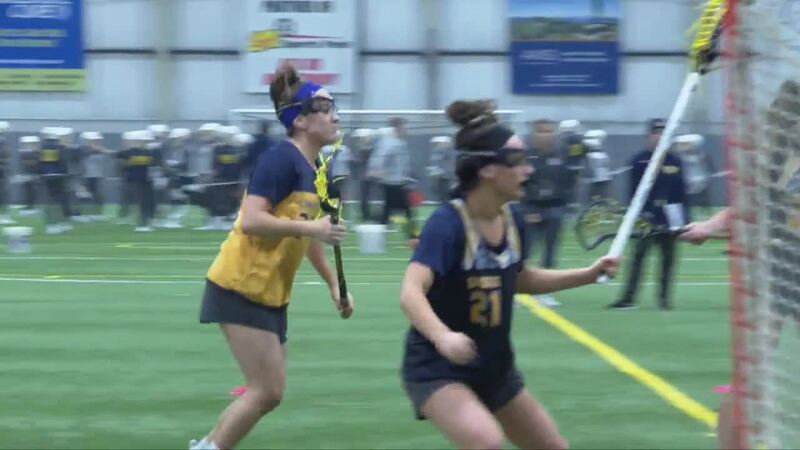 BUFFALO, N.Y. (WKBW) — The Canisius women's lacrosse team has a special bond. "We pride ourselves a lot in family and just being one family," said head coach Allison Daley. But for Antonia, Miranda and Marissa, their bond is a little more special. "It's been fun," they said. "It's been wild. There's been some fights but what do you expect"? That's because the three aren't just sisters, they're triplets. Following in their older sister's footsteps, they started playing lacrosse back in elementary school and always dreamed of playing together after high school. "We played together our whole lives so we didn't really want to split up," Miranda Malvaso said. "So if we could play together, we wanted to go play together. Canisius College gave them that chance, a program that's known for recruiting sisters. The Malvaso sisters are the first known set of triplets though and coach Daley says it's just another unique aspect to this talented squad. "They're their own person and their own unique individual which I think is helpful," Daley said. "They get to show their own true personalities." Personalities that come out on the field. But while different in their own way, they all share what they call sister intuition. "I feel like if I chuck a pass at Miranda's head, she's gonna catch it just because," laughed Marissa. "I don't even think twice." Miranda responded. "I just throw it to Marissa and assume she's gonna catch it." "We just know where each other are on the field," Antonia added. A triple threat and sisterly bond that brings the true meaning to "Griffs family".